Celebrating funding to create the Moree Youth Precinct, back row, left, Moree Plains Shire Council’s Project Officer Lila Fisher, Nicki Drenkhan, Skye Spooner. Front, Ros Laws, Alexandra Beatty, Northern Tablelands MP Adam Marshall, Jacqui Moore and Councillor Stephen Ritchie. NORTHERN Tablelands MP Adam Marshall says a $99,000 NSW Government funding package will be the first big stage in redeveloping the existing skate park to create an exciting new Moree Youth Precinct. 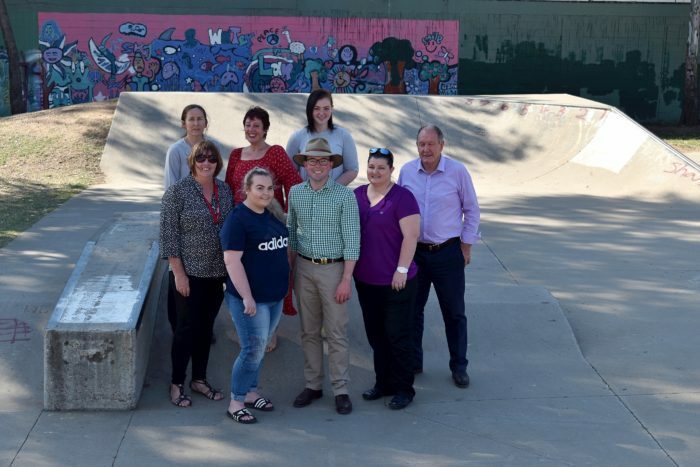 Mr Marshall announced the grant from the second round of the NSW Stronger Country Communities Fund that will see a big revamp of the skate park in Balo Street. Mr Marshall said the project would see the creation of Moree’s Youth Precinct for outdoor recreation with the construction of a half-court basketball court and a new fixed shade shelter over the existing skate bowl. “There’s been a lot of community consultation over this, including barbecue chats in the park and feedback from community safety and Moree inter-agency meetings and they’ve show strong support for development of this area,” Mr Marshall said. Mr Marshall said the basketball half-court will be built adjacent to the skate park but its concrete surface will also provide a scooter, skate board, and bicycle training area for young people. “And the installation of the shade shelter will provide much-needed protection over the skate bowl during the hottest times of the day when the kids are there,” he said. Moree Plains Shire Mayor Katrina Humphries welcomed the funding injection. “It is great to see this project get a start,” Cr Humphries said. “It’s very important for our kids to have a safe place to skate and ride their bikes. Cr Humphries said the Stronger Country Communities Fund projects were incredibly valuable to smaller communities, particularly in Moree Shire where a number of outlying centres have been recognised with grant funding. “They will make a huge difference,” Cr Humphries said. Former chamber of commerce executive Melanie Jenson said the local business group had supported the submission for the project funding. “It’s a really popular place for kids and we’ve spoken with kids who use it and they’re really enthusiastic about the plans. It’s a precinct that needs work, it’s really the start of the CBD and it needs some beautification,” Ms Jenson said. Mr Marshall said the revamp would pave the way for making the Youth Precinct an even greater community asset and give young people a greater sense of inclusion and ownership of the recreational space.